Keeping your employees motivated is one of the best practices that lead to company productivity. A happy and satisfied employee obtains good communication skills and they get works properly done. Meanwhile, if you lack enhancing employee morale then it might direct your company towards low turnovers and break its success. The idea to motivate employees is influencing since the mid 1970’s. At that time, the US workforce went through an overall turn down in productivity since the disengagement and distance created with workers. Giving workers a piece of your bread turns the key and they work harder and happily. But that does not mean that you should fill in their pocket with cash to make job done. This is the most negative factor that most of the bosses apply but the effect will remain temporarily. Therefore, there are certain aspects to boost employee morale, and yes, they are the positive ones. When you work together in an organization you should stay collaborative because that empowers your staff. Keep your work environment friendly and certain. When you plan something new, ask for your employees’ feedbacks and take advices from them. This will not only bring out new ideas but will also show how significant is their opinion to you. Make them recognized by praising and rewarding their performance in front of the entire staff without making any stoppage. This is a very effective practice if you take the action promptly instead of lagging and delaying it for a later time. Praise them where the task is freshly done because that will lead to effectiveness. This is a very precise form of appreciation. 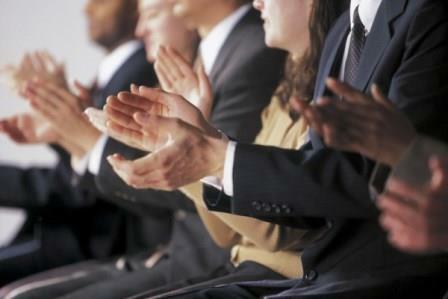 Applaud your employees at social functions and gatherings physically by giving a round of applause for certain achievements. Whenever your company holds a meeting or a sponsored gathering give them an ovation when they share their ideas and make them realize how their opinion’s worth the company. Learn what they want to gain from your company. It can be an improved lunch at your office or can be a raise in pay. Know their thoughts and obtain a chance to supply them. Not a promise but you can assure them to look after the matter so that they won’t need to turn off their backs from you. Do not pretend to be an egocentric boss and stay away from your employees’ sight. Communicate with them to learn about their problems. 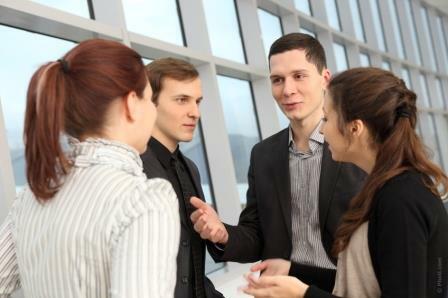 Communicating within a group or team might not resolve the issue but you need to talk individually with them. A study was published in Harvard Business Review that employees have an instinctive yearning to stay bonded with others to seek some assistance. Take your staff out on an unofficial outing or a work trip. This helps know them personally and in a better way. This is a kind of medical practice that eases your brain and keeps away all the junks. Another study from the Georgetown Law School and the Alfred P. Solan Foundation discovered that 80% workers like elasticity in work. This keeps away the boredom from their daily work schedule and provides satisfaction to them. Doing a project work personally puts a different kind of concentration towards it. Let your employee passionately work with it. Allow him extra time to put his dedication towards work because a work done in hurry is never perfect. This will give him a break from the regular tasks and he can work for the company’s innovation. To increase productivity, you need to wake up the laybacks in your company. Create a feeling of awakening obstacles to make them work promptly. Make them realize that the task is of high priority and equip leaders to communicate individually with employee with their planned goals. Here perks does not mean money. Perks for employees can be related to other small prizes to boost employees’ productivity in workplace. Give your workers the flexibility to work. Study reveals that employees who work with flexibility obtains good productivity and are highly satisfied. Give them a pat on their back when a job is well done. Or you can offer them a special treat to feed their soul. Be a fun loving manager because your mood also affects your employees’ instinct. Richard Tuck, CEO of Lander International, reveals that he never tries hard to keep his staff happy. He hires people who know the process of doing that for themselves. A candidate should contain the team spirit to lead in a particular industry. He should be capable to be a life support for this organization and co-workers so that the other employees can rely upon him. Take bold step toward job enrichment and choose jobs which have less productivity, poor attitudes and costly hygiene. Approach them with an assurance that they can be changed. Create a brainstorming list with your plans and goals to change them and let your manager and supervisors understand the changes so that they realize their mistakes they have done. As everyone knows laughter is good for health it should remain as a common practice in workplace. Employees love to stay joyful and contented so that they can consistently work with motivation. So keep your work environment in glee and satisfied always. Unity is diversity. This practice has worked since ages and till now the most motivational leaders practice it. Promoting unity help workers achieve their goals individually, as well as within a team. This gives them a realization of respecting their team members, plan together, fall together and rise together. 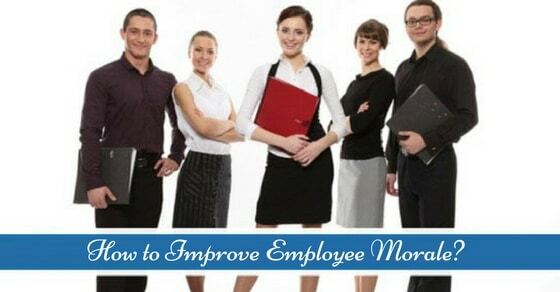 There are such seminars who teach, you are the practicality to improve employee morale in several ways. Go through the Watson Wyatt Worldwide’s study published in WorkUSA 2002 where they depicted how powerful factors like trust in management and employee engagement bring an improvement in your organization’s profit. You can also read few inspirational magazines like Fortune and Inc. or Fast Company to learn the best practices. Few practices are learnt from your previous experiences where you discover the do’s and don’ts. Always appreciate new ideas and welcome them rather avoiding for your own ego. Since your employees are now a part of your company, you should apply new methods suggested by them. Judge the ideas based on the plan and then apply it if you find it appropriate and right for your company. Human nature is very sensitive. Dr. Edwards Deming, a renowned quality expert, once wrote in a letter to The Fifth Discipline author, Dr.Peter Senge that the existing management system has destroyed our people. Keeping this point in view later Dr. Senge wrote that our existing management system is inconsistent with human nature. Inconsistency with human nature affects your work quality and people start working with a poorer vision. Apart from developing your own instinct, you should take a bold step to develop your employees’ mental abilities. Hold a session with your employees to teach them new skills in bringing out productivity. Every person has the potentiality to go beyond his existing level of functionalities and the manager need to bring that potentiality out of them. That is one of the most creative abilities of a boss. Don’t just allow them to work 5 days a week but also give them a reason to work. Be conscious about exceeding expectations and assure them the loyalty of keep the motivation on. Being in a superior position is one of the most challenging jobs in business sector since your juniors look up to you. You don’t need to be friends with your employees but need to develop that power to trigger feelings in them. Keep consistently connected to them and talk solely with each of them. That will make them feel extraordinary and keeps them inspired. Develop the motivating power in yourself so that your employees don’t feel pissed off while speaking to you. Your employees are the leaves in your tree; if they shatter away your tree would go lifeless.